The signs of spring have begun to pop up all over the place. For many people it is the time to do a thorough household spring clean. Although this annual ritual is a great way to invite spring into our homes, it also can carry potential health risks. This month in our AEF blueprint we will learn how to be safe when cleaning out our homes as well as how to include dietary fiber in our diet to properly clean out our bodies as well. As you begin your spring cleaning bring awareness to how you are using your body for these activities. It is important to stretch before spring cleaning. A little stretching can go along way to prevent straining or pulling a muscle. Learning how to properly protect your lower back is one of the best things you can do for your body. 90 percent of adults experience lower back pain at one point in their lives. Many people do not think of house cleaning as exercise but did you know that housecleaning can burn up to 200 calories an hour! Here are a few key things to remember when spring cleaning. Avoid the combination of bending and twisting as it puts you at a higher risk of back injury. Remember to always lift heavy loads with your legs and not back. Avoid prolonged deep squatting as it stresses vital tissue within the knee joint. Instead kneel on one knee being sure to alternate knees or it possible, sit. Thousands of injuries occur while gardening every year. It's easy and tempting to take on more spring cleaning chores than your body can accommodate. So be sure to take breaks throughout. Ask Dr. Vantanajal what he recommends before starting your spring cleaning! Now for properly cleaning out your body, this is where dietary fiber comes to the rescue. According to the Canadian Digestive Health Foundation more than 20 million Canadians suffer from digestive disorders every year. Very few people speak openly about their digestive symptoms; therefore the magnitude of the problem is underestimated by government, employers and the general public. Fiber aids digestion, lowers cholesterol levels, and may reduce the risk of disease and obesity later in life. Dietary fiber, which is found only in plants, is divided into two categories: soluble and insoluble. Soluble fiber dissolves within the digestive system and generally passes through the body without being absorbed. Insoluble fiber, or roughage, passes through the intestines virtually unchanged. Insoluble fiber adds bulk to the stool and speeds transit time through the intestines, potentially reducing the risk of colon cancer. Sources: Soluble fiber is found in peanuts, lentils, beans, barley, oats and oat bran. Excellent sources of soluble fiber are fresh fruits and vegetables especially berries, unpeeled apples and pears, avocados, peas, artichokes, parsnips, prunes and dates. 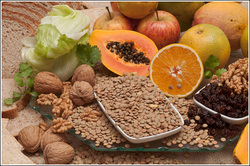 Insoluble fiber is found in all whole grains, wheat bran, fruit and vegetables, corn kernels and seeds.